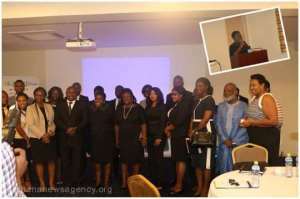 A strategic evidence-based data survey on employee's performance, remuneration and welfare in the banking sector was on Tuesday launched in Accra. The survey christened 'Ghana Banking Human Resource Survey' was to provide the banking sector with the needed information of their employees for effective and efficient planning purposes. Mrs Elsie Appau, the Regional Managing Director of Acreaty Ghana, a human capital organisation, speaking at the launch, said employees play a vital role in every organization, and that, there was the need for companies to give them the right incentives to retain them. She said her outfit necessitated the survey because it realised that there was too much disparity and lack of information when it comes to the banks, bench marking themselves and having relevant evidence-based information on remuneration and salaries to properly compensate their staff. 'As a human capital company, we realised that it is not just enough to employ people or share curriculum vitae to our clients or organising training programmes, but also the need to understand the opinion of employees, and what they stood for and their contributions to the development of their banks', she added. She said a few banks have collapsed and a number of them had merged, and attributed the phenomenon to lack of planning, proper incentives and lack of a succession plan. She noted that performance management was key to the development and growth of any banking institution, and that, it behoves on employees to increase their productivity and enjoy the best of incentives. 'We are not talking about salaries but rather equal pay for equal work, it is what you have done and the evidence of it should influence how much to receive. According to her, performance was not just what you do but what you stand for and ensuring that there was transparency in the system, proper growth and succession plan for the company. She said 'international banks were able to exist for over 70 years while some of our local banks cannot live beyond a decade, due to the inability to develop a succession plan for the company'. Mr Kwabena Adjekum, Head of Business and IT Consulting, Acreaty Ghana, said the survey would focus on the 35 banks in the country, which would be in a form of mobile technology, with a random questionnaire distributed to staff of the banks. He said the report content would focus on compensation and benefits, job satisfaction, relationship with management, job motivation, job change and competitor compensation. Mr Adjekum said their outfit hopes to expand the scope in the coming years to include corporate culture, change attitudes, training and capacity building. Dr Ken Kwaku, Board Chairman of Acreaty Ghana, said the banking sector lacks a clear view on the quantity and quality of human capital because there was 'a disconnect' between the educational system and what the market system needs. He called for specialised skills to address the system, and that, institutions like the Universities, and the banking institute must focus on skills development knowledge and not necessarily on credentials, since too many of the training were geared towards certificate.